The classic game of liar dice! Perudo South American Liars Dice is an exciting game of guesswork, bluff and luck. The combination of deception, skill and laughter make it the perfect after dinner game. The object of the game is simple - to be the last person with dice. 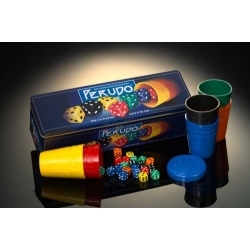 Start with 5 dice each and roll them on the table, using the cup to hide the results from everyone else. Taking turns, each player calls out how many dice of a given number appear under everyone's cups combined. Aces are wild. The strategy? Each bid must be higher than the last. If you don't think you can go any higher, challenge the last bidder. But be careful - whoever is wrong loses a die. Play continues until only one person has any dice left.